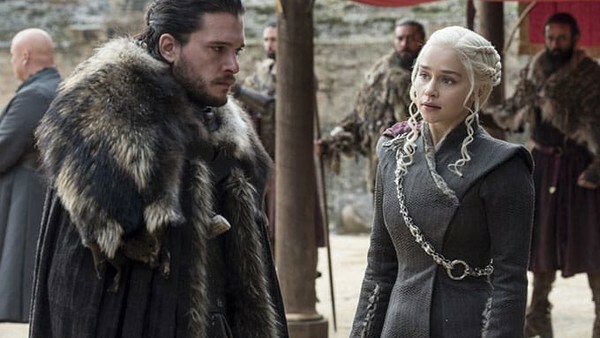 Daenerys and Jon are, in many ways, two sides of the same coin: outcasts who never expected they'd be the one to rule, thrust into leadership positions they're not fully equipped for, with good hearts having to make some terrible decisions. Of the two, though, it's Jon who is seen as being the nobler, which comes from his upbringing under Ned, and the fact he's half-Stark, rather than a full-Targaryen. They are a pair who aren't only in love, but are on journeys to defeat their enemies that have now conjoined into one: defeating the Night King. This is the path to light that Jon's death set him upon, but that begs the question of what the 'shadow' means for Daenerys. Based on Season 7, it could be the death of her dragon - we've seen imagery of a dragon's shadow before, albeit Drogon, and Viserion's death has truly invested her in the fight against the dead. Then again, it could be that Drogon is the shadow after all, and that he will also serve as the Lightbringer to Dany's Azor Ahai. Or, it could be that, much like Jon is Ice and Daenerys is Fire, Jon is Light and Dany is Shadow. Only by joining the two together can the war be won. Or, on a darker note, only by defeating the shadow can light prevail, which fits with the idea that Daenerys will have to sacrifice herself, i.e. pass beneath the shadow, to touch the light, i.e. victory for the living, and the afterlife - with Drogo - for Daenerys. What do you think about Daenerys' links to the Starks? Let us know down in the comments.